Are you familiar with the health conditions common in big dogs? Your large breed dog may be at increased risk of developing one or more of these conditions. Hip and elbow dysplasia occur due to malformations in the hip or elbow joints. As a result, the bones don't move smoothly in the joints and, instead, grind or rub together painfully. The condition may eventually cause arthritis, joint degeneration and inflammation, lameness, and difficulty climbing stairs or jumping. Dysplasia is often inherited and can cause symptoms early in your pet's life. Hip dysplasia is common in German Shepherds, Bernese Mountain Dogs, Labrador Retrievers, Great Danes, St. Bernards, and other large dogs, while elbow dysplasia is often seen in Golden and Labrador Retrievers, German Shepherds, and Rottweilers. Maintaining a healthy weight is particularly important for dogs who have hip dysplasia. Even a few extra pounds can increase pressure on the joints and worsen your pet's symptoms. Although pain medications and joint supplements might improve your pet's comfort, surgery may be needed in some cases. Surgical procedures are used to reposition or deepen joint sockets in young dogs with hip dysplasia, while total hip replacement surgery is the best option for older dogs. Dogs that have elbow dysplasia may also benefit from surgery. Bloat, or gastric torsion, happens when your dog's stomach stretches, then twists or rotates. The life-threatening condition can prevent blood from reaching the stomach or other parts of the body and may cause tears in the walls of the stomach. If your dog doesn't receive immediate veterinary treatment, he or she may die. Big dogs may be more likely to develop bloat if they eat too quickly and swallow air as they eat. The swallowed air can build up in the stomach, causing it to dilate. Bloat symptoms include swollen stomach, drooling, anxiety, pacing, inability to vomit, shortness of breath and rapid heartbeat. Your pet's veterinarian can decrease pressure in the stomach by inserting a tube into the stomach or puncturing it with a needle if the tube won't fit due to twisting. Surgery will restore the normal position of the stomach if it has twisted. 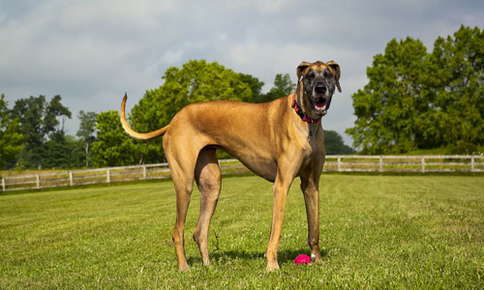 Dilated cardiomyopathy affects a variety of large dog breeds, including Great Danes, St. Bernards, Newfoundlands, Afghan Hounds, and Doberman Pinschers. The condition makes it difficult for the heart to pump blood efficiently and increases the size of the organ. Symptoms of dilated cardiomyopathy include coughing, rapid breathing, weakness, fatigue and fainting. Although there is no way to improve the condition of the heart, medications may help control irregular rhythms and delay the progression of the disease or the development of congestive heart failure. Large dogs may also be more likely to develop aortic stenosis, a condition that restricts blood flow to the heart due to a narrowing along the aorta. If your dog's condition is mild, there may be no obvious signs. In fact, the condition may only be discovered if your pet's veterinarian hears a heart murmur during an exam. Dogs that are more severely affected may have trouble breathing, breathe rapidly or faint. Heart medications can be helpful for some dogs. In severe cases, cardiac catheterization may be recommended to widen narrowed areas. Entropion and ectropion can affect the eyelids of big dogs, causing pain and irritation. Entropion occurs when the eyelids roll inward, while ectropion causes the lids to roll outward. Eyedrops and ointments that protect the sensitive tissues of the corneas and the lining of the eyes can be helpful if your pet has a mild form of either condition. Surgery may be recommended for severe cases. Regular veterinary care helps you safeguard your big dog's health. If you're concerned about a health issue, or it's time for your furry friend's checkup, give us a call to schedule an appointment. NEW PATIENTS RECEIVE FREE NAIL TRIM WITH FIRST VISIT. SIGN-UP USING THE FORM OR CALL US AT 734-429-4488 TO TAKE ADVANTAGE OF THIS EXCLUSIVE OFFER.